Is it a sin to read books from other religions? We got this fantastic question recently. Hey Lucas I had another question. Do you know any scriptures on reading other religions books? 2 John 10-11 says don’t bid anyone Godspeed who has another doctrine. Is it still okay to accept a copy of the Book Of Mormon even if you already know it to be a lie full of damnable heresies? Anyways I’ll just tell you in short last Sunday I went to a LDS church because I wanted to preach the true good news of justification by Faith alone and to warn of judgement and the Elder I spoke to gave me a copy of the Book of Mormon and said we could talk again. Was it sin in accepting the Book? I have been examining it to show them the impossibility Of there False Gospel anyways my question should I continue to do this or no? Great question. Let's first take a look at the verses you mentioned. First, we need to define some terms. What does it mean to to "receive into your house" and "greet"? In this context, John is talking about traveling teachers and the practice of hospitality. So let's imagine that a traveling evangelist comes to town and is looking for lodging and food while he does his preaching work in your city. Before you decide whether you will offer him lodging and food you need to find out if he teaching sound doctrine. If he is teaching sound doctrine then you're free to offer him lodging and food. If he's a false teacher don't invite him to stay in your house. So, today the terms might be different but the concept is the same. Let's say you see an evangelist on TV who you are certain is a false teacher. He asks his viewing audience to send him money so that he can gobble up more satellites and broadcast to millions of more people. If he's a false teacher, don't support him. Don't send money. If the above line looks funny, it may be because you don't have a Greek font installed on your browser, or it may just be that you don't read Greek. Don't worry I'll explain. So English translations usually render the word χαίρειν as "greet" but if you look it up in a lexicon, it has a wider range of meaning. It's often translated as "rejoice" or to "be glad." Digging deeper, the term χαίρειν can refer to things said to royalty like "long live the King" or "Hail the King." In this sense, we begin to see that what is meant here is offering encouragement or praise of someone, and by proxy the work they are doing. Most modern greetings offer some kind of emotional encouragement and praise which is why it can be translated as "greet." However, there are greetings that don't offer any encouragement and praise. So, from this, we find that saying, "hello" to a false teacher is probably fine, but saying "Good luck to you in your ministry" is going too far. So in effect what John is saying is, "don't give encouragement or support to false teachers." So is accepting a book from a Mormon offering encouragement and support? I don't think so. 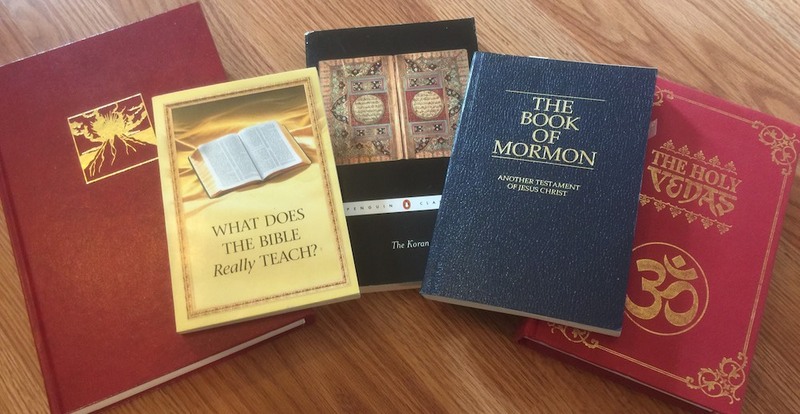 Accepting a Book of Mormon may be the best way to determine if someone is a false teacher. Inviting Mormon missionaries to come live in your house for six months, free of charge would be going too far. Reading a religious book is different than supporting a missionary of another religion. Reading is ok, supporting is not. How do we know reading is ok? Paul did it. When he was in Athens Paul perused the pagan temples and read their writings. For though I am free from all men, I have made myself a servant to all, that I might win the more; and to the Jews I became as a Jew, that I might win Jews... to those who are without law, as without law (not being without law toward God, but under law toward Christ), that I might win those who are without law; to the weak I became as weak, that I might win the weak. I have become all things to all men, that I might by all means save some. Now this I do for the gospel’s sake, that I may be partaker of it with you. Paul was a chameleon. He could act like a Greek when he was around Greeks. He could act like a Jew when he was around Jews. he could act like the lower class when he was with them. He could only do this because he was well educated, well read, and experienced in all of these spheres. Now let me give a personal note on my own approach. I have a whole section in my personal library devoted to the holy books of other religions. I've read all of the Koran and Book of Mormon. I've read the Vedas, The God Delusion (along with other atheist books), the New World Translation and a number of Jehovah's witness books (like Harp of God, and Millions now Living will Never Die). I have a lot more on my reading list like Dianetics (Scientology) along with other Buddhist and Hindu texts. I have a goal of eventually even reading the Talmud but it's about 6000 pages, so that might take a while. I've also visited worship services of other religions, The Mormon ward locally, and a Mormon temple in West Texas (although I wasn't allowed to go in the Temple since I was an outsider). I went to their Bible study, worship service etc. I've met with Mormon missionaries probably about a dozen times. As for Jehovah's witness, my record is the same. I've visited a local kingdom hall, met with witnesses on a regular basis. I've visited the mosque in East Texas and spent time discussing faith with the Imam. I've visited famous Hindu temples in India and well known Buddhist temples in Thailand. At each of these, I do a lot of question asking and not much "preaching". That's because I'm there to learn. I want to be well educated so that when I encounter people of those faiths I can show respect by knowing something about their culture and religion. Here is an important lesson that virtually everyone who lives on social media should learn. Listening politely is not the same as agreeing. I can listen to what someone believes and thinks without choking them purple. I listen so that I can be effective. Even if I am pretty sure I can't convert the person I'm listening to, I can at least learn from them. I say all this for a few reasons. First, I'm a nerd and I like this stuff. But secondly, I believe it's crucial to know what other religions teach if we want to reach them. In some cases, it's not a must, but one of the greatest missionaries the world has ever seen, Paul, was well versed in the religion and culture that he visited. It goes a long way in a discussion to be able to say, "Yeah I've read your holy book, and visited a _____ house of worship." You've heard the idioms, "there's safety in numbers," and "stay with the pack." In a sense, that's what Paul is saying. If we want to be mature, and avoid being tossed around by various teachings then we need to listen to the Apostles (by reading what they wrote in the New Testament) and be part of the Body of Christ (by being involved in a Bible teaching church). That's where the safety comes from. If you want to be an effective missionary to those of other religions, the first step is to know your Bible very well. Secondly, you need to be plugged into a healthy church with strong friends in the faith. You need people to debrief you when you have run-ins with those of other faiths. You need to have wise counselors to help you through the inevitable questions that will arise. All of this should be part of the church you attend. If you don't have it at the church you attend, then start praying for that kind of network. You'll need it. So here's the point: Don't spend more time reading other religious books until you know your own. Don't be a lone ranger, you need support. Educating yourself on other religions is good, but it is for the mature. It is for those who are ready. Whether you are ready is between you and God. "Read through the book of Mormon and see if you get a warm feeling when you finish it." This is a pretty brilliant tactic for a few reasons. First, I get a warm feeling after reading any book. It's an accomplishment. I get a warm feeling when I read Harry Potter, that doesn't mean that I should believe in Harry for everlasting life. Reading books makes a lot of people feel good. That's why they do it. So, this is not a good measure of truth. Second, the book of Mormon is hard to read. Really hard! It's like a billion pages and it's in old(ish) English and it's non-sequitur. Jo Smith plagiarized large sections of the King James Bible, but he did it in such a way that the sections don't make much sense in context. So there are these lengthy sections where you'll be scratching your head saying, "what's going on?" So most people that start to read the Book of Mormon don't finish it. This plays in the Mormon missionaries favor because then they can say, "oh you didn't read it, then how do you know it's false?" It's a power play on their part. Or you don't finish it, and you can't mount an effective discussion. Since you haven't read their Holy Book, you don't really have any more moves. End of discussion. So what happens if you do finish it but don't buy in? Well, they have a play for that as well. Converting Mormons is hard. Converting Mormon missionaries is VERY hard. So, if you spend time with Mormons, don't consider it a loss as long as you are learning something.